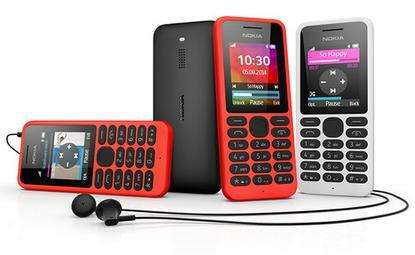 The Nokia 130 costs just $25 before taxes and subsidies. Microsoft's Devices Group has unveiled the Nokia 130, a mobile phone that costs just US$25 but lacks an Internet connection and apps. The focus of Microsoft's mobile device strategy is on building both high-end and low-cost smartphones running Windows Phone, but there is still a need for "ultra-affordable" mobile phones, the company said on Monday. With the 130, Microsoft is going after people in emerging markets who are buying their first phone. It's also a good fit for people who want a backup to complement their existing smartphones, according to the company. The $US25 price tag (before taxes and subsidies) is about $90 cheaper than the Lumia 530, which is the lowest cost Windows Phone Microsoft has introduced so far. The price difference with the cheapest Android-based Nokia X -- which was recently killed in favor of Windows Phone -- is about the same. For many people in the emerging markets that Microsoft is targeting, a price tag over $100 is simply too much. The company hence feels it needs to offer them a more affordable alternative to prevent them from going to another vendor from whom to buy a phone today and possibly a smartphone in the future. The 130 has a 1.8-inch color display and will be available with one or two SIM cards. Microsoft also brags about a month-long standby-time, which is a boon for users that live in parts of the world where access to electricity isn't always a certainty. The phone also has a built-in video player, music player, an FM radio and a flashlight. It's expected to begin shipping in the third quarter, and will be available in countries such as India, China and Indonesia. The choice of this trio is far from a coincidence; they added the largest number of new mobile phone subscribers in the world during the first three months of the year, according to a survey conducted by telecom vendor Ericsson. There might be a market for products like the 130 today, but the window of opportunity is closing quickly thanks to a continuing decline in smartphone pricing. For example, Mozilla Foundation and chip maker Spreadtrum have developed a reference platform and partnered with Indian vendors Intex and Spice to launch ultra-low-cost Firefox OS smartphones in the next few months, they said in June. Spreadtrum has said the phones will cost about $US25. That means Microsoft has to continue to work on making Windows Phone available on smartphones that cost well below $100, which is what Google is doing with Android. The 130 will also go on sale in Egypt, Kenya, Nigeria, Pakistan, the Philippines and Vietnam.